Aqua Lungs. Black & Neon Green Knee High Stockings. Black & Neon Striped Toe & Stainless Steel Spiked Counter Heels. Night Breeder. Buckle & Strap heels. Inspired by Pleaser. Colonial Coroner. Spider web net-Knit knee socks. 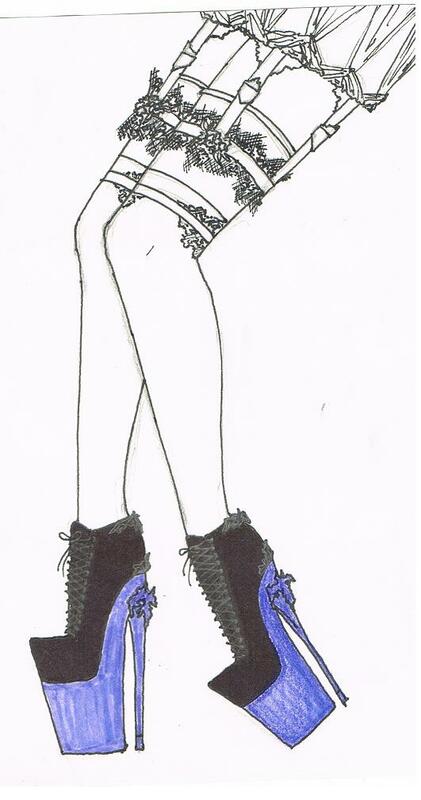 Lace trimmed, Emerald Monster Cameo, silk ribboned shoes with Velvet & Lace platform and heel. Sugar Spun Web. Black & White Knee high socks with embroidered sugar skull. Black booties with striped platform and heel. Ivy Interior. Neon Green, Red & Black Leopard print platforms. Green Turkey feather skirt. Inspired by The Cramps. Skelitone Plague. Black & Neon green platforms. Severe Psychotic Breaks. Neon green thigh high stocks. Black & purple heels with monogram front and Neon green outersole. Chiffon skirt with gather detail. Garter belt with metal rose-shaped closure and lace trimmed elastic. Lace applique thigh high stockings. Black and purple booties with Bat-shaped detail.